At the beginning of the 20th century, Jewish integration into Italian society appeared well on its way, as prime minister Luigi Luzzatti took office as one of the world’s first Jewish heads of government in 1910. 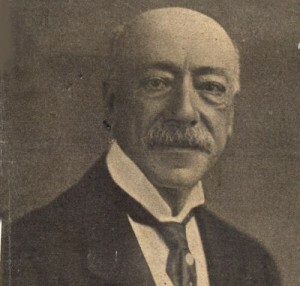 Another Jew, Ernesto Nathan served as mayor of Rome from 1907 to 1913. Italian Jews volunteered in large numbers in World War I, further strengthening their sense of loyalty to the Italian Kingdom. As Mussolini came to power, some Jews initially adhered to the Fascist regime, while others were active in the anti-Fascist movements. Most Italian Jews were persuaded that Italy was immune to the modern racist anti-Semitism that was spreading throughout Germany and elsewhere in Europe; they saw Italy as a fortunate exception. As the Fascist government became dictatorial, it increased its control over the Jewish community (codified in 1930 by laws of reorganization of the Jewish community), and launched a policy of gradual elimination of Jews from important positions. For the Jewish community, anti-Semitic articles published by major Catholic newspapers represented the first moment of crisis. During the Libyan War (1911-1912), members of the Italian Nationalist movement unleashed an anti-Semitic offensive. The conquest of Ethiopia in 1936 fueled racism against blacks in Italy. Diversity became analogous to inferiority, and the opposition between the “weak,” “inept,” and “uncivilized” blacks and the “white,” “noble,” and “strong” Italians was continuously reinforced. These positions became sanctioned by law; a decree in April of 1937 prohibited marriage between Italian citizens and African subjects. The preexisting Catholic anti-Judaism, new political anti-Semitism, and theories of colonial racism constituted elements that, fused together, fueled the campaign against Jews in the years of persecution. In 1937, a systematic campaign was launched through the state-controlled press, reinforcing anti-Semitic accusations and stereotypes. The theoretical text Il Fascismo e i problemi della razza, written with direct pointers from Mussolini, was published in July. It affirmed that “human races do exist” and that “the Jews do not belong to the Italian race.” This was the explicit biological ground that the government intended to give the anti-Semitic legislation that was already being drafted. The first measure aimed at taking control of the Jewish community was the census of August 1938, containing a detailed record of all personal data. One essential part of the legislation was to arrive at a biological definition of “the Jew.” The definition of “Jewishness” was established through a complex set of considerations and rules. A large sector of the Italian bureaucracy was deployed in this operation which required not only notary records but also informants and spies. In September 1938, the “Racial Laws” removed Jewish students and teachers from schools and universities and arranged for the expulsion of Jews who were deemed “foreigners” not having Italian citizenship or having been stripped of it by the laws. In November, it became illegal for Jews to marry non-Jews, to own businesses, land or houses beyond stipulated limits, to have non-Jewish house servants, or to be State employees. Subsequently, Jews were banned or at least restricted from practicing their professions. They were gradually expelled from social, economic, and cultural activities and precluded from much private employment as well. At the time those classified to be of the “Jewish race”, both Italian and foreign, were around 51,000. By the time of the racial laws, like all Italian society, the Italian Jewish institutions had underwent a process of “fascistizzazione”. Through the laws that prohibited free association and the large system of social control put in place by the regime, the small Jewish minority had been purged of its dissenting elements and its autonomy had been curtailed. The Falco law of 1931, centralized Jewish institutions under the control the Ministry of the Interior, eliminated small communities and established “Jewishness” as a mandatory legal status rather than a matter of personal religious choice. The Jewish leadership was conscious of the fragile situation of its institutions and cautious in all its moves. While in some cases leaders had embraced Fascism, most of them had very little choice but trying to sustain community life in a situation in which the civil and religious liberties granted to Jews in the liberal period had clearly been repealed. Imbued of the culture of Risorgimento and in a profound loyalty to the Italian State, the older Jewish leadership probably did not fully understand what was happening until the promulgation of the Racial laws. After 1938, the Jewish community was committed first and foremost to helping children expelled from schools to continue their studies. The promulgation and application of anti-Semitic legislation was accepted by the majority of Italians with indifference and acquiescence. The Vatican supported the laws and limited itself to upholding the right of celebrating mixed marriages. As Italy entered the war in 1940, Jews gradually went underground, abandoning their homes, using false names, and searching for places of refuge. In the dark period from 1943 to 1945, the fascists and later Nazi-fascists carried out systematic persecution of the Jews in Italy. According to historian Michele Sarfatti’s definition, the assault began as “persecution on Jewish rights” (1936- 1943) and escalated to a “persecution on Jewish lives” from September 1943 to August 1945. Rome was liberated in June 1944, Florence in August, Milan in April 1945; Berlin surrendered in May. After seven years marked by discriminatory laws and deportations, the Jewish community in Italy had been reduced to half its size. Starting in 1944, the anti-Jewish laws were gradually rescinded as territories were liberated. In the post-war era, Italian Jews contributed in numerous ways to the reconstruction of the country and the founding of a democratic republican state. Many were actively involved in the Zionist project that would eventually give rise to the State of Israel.